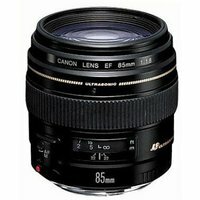 The Canon EF 85mm f1.8 USM lens is a highly practical and creative medium telephoto lens. It features a bright, fast constant maximum aperture of f1.8, which delivers beautiful background blur and makes it ideal for shooting in low-light conditions. Its optical construction consists of 9 elements in 7 groups, with Super Spectra coatings to reduce ghosting and flare and produce sharp, clear images.